State-space models are widely used in ecology. However, it is well known that in practice it can be difficult to estimate both the process and observation variances that occur in such models. 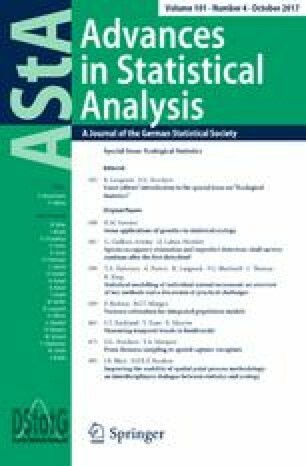 We consider this issue for integrated population models, which incorporate state-space models for population dynamics. To some extent, the mechanism of integrated population models protects against this problem, but it can still arise, and two illustrations are provided, in each of which the observation variance is estimated as zero. In the context of an extended case study involving data on British Grey herons, we consider alternative approaches for dealing with the problem when it occurs. In particular, we consider penalised likelihood, a method based on fitting splines and a method of pseudo-replication, which is undertaken via a simple bootstrap procedure. For the case study of the paper, it is shown that when it occurs, an estimate of zero observation variance is unimportant for inference relating to the model parameters of primary interest. This unexpected finding is supported by a simulation study. The online version of this article (doi: 10.1007/s10182-017-0304-5) contains supplementary material, which is available to authorized users. We thank the Associate Editor, Roland Langrock, two anonymous referees, Stephen Freeman, Mark Maunder, Leo Polanski and Martin Ridout for their very helpful comments. Here, we give the short R programme for fitting a cubic spline, using cross-validation, and evaluating the standard deviation of the jacknife residuals. In the programme, x is a vector of the census years and y is a vector of the census values.